Employee Provident Fund (EPF) scheme, the main approach is to provide benefit to the employees at the time of their retirement. The EPF scheme specifies that a nominal amount is deducted from the employees’ salary as a contribution towards the fund. Tax on PF withdrawal is the main concern of the employee who leaves the company early. The changes regarding the Income-tax rules on the EPF withdrawal are discussed below. If the employee has not completed 5 years of his/her continuous service. The whole amount in the EPF cannot be withdrawn till the age of retirement. The PF account consists of the contribution made by the employer, a contribution made by employee and interest earned on employer and employee contribution. Female employees are given exemption who is resigning from the services for getting married or due to childbirth or pregnancy. So, they can withdraw the whole EPF Balance. The retirement age is 58 yrs. A person can withdraw up to 90% of PF balance on attaining the age of 57 yrs. The membership as an employee would not withdraw the full PF balance till the age of retirement. This completes our post on Tax on PF withdrawal. If you have any queries regarding this post kindly drop down your queries in the comment section below. If I am resign before completing 10 yrs. than I am eligible for getting whole amount that is employees share + employer share + deducted pension amount form employer share? or not. Yes Sir. If you resign before completing 10 years, then you will be eligible for the whole amount provided that you don’t continue employment. If you do start working in a new company, then the account will be transferred. Dear Sir, EPF exist date will be updated by your employer. Please contact the concerned person in your organization for the update. 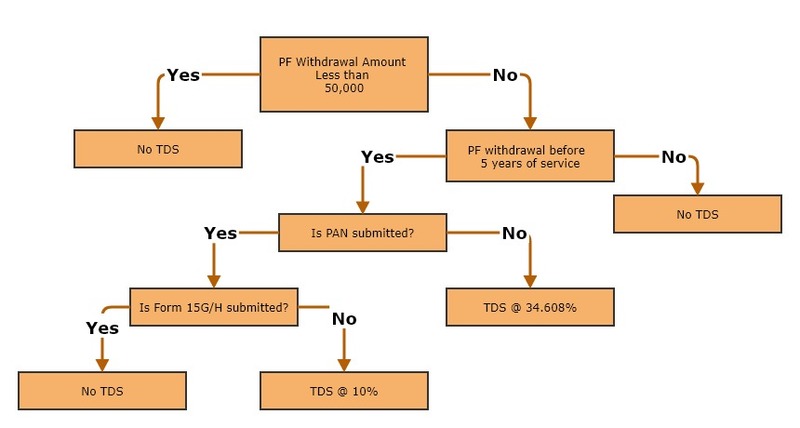 Hi, Thanks for the flow chart, it makes it very clear but if the PF amount is 45000, EPS amount is 25000 and employment period is less than 10 years, will a person get taxed. Asking because the PF amount is than 50000 but PF plus EPS is more than 50,000. Sir, tax is calculated only on the EPF amount and not on EPF+EPS amount. Hence, if the EPF amount is less than Rs. 50000 then no TDS will be deducted.